The primary goal of this conference was to explore, from a variety of perspectives, questions related to the production, distribution and reception of books. The conference programme was organised around three primary axes: 1) the history of the book and the evolution of the medium over time; 2) the status of the book in contemporary culture, where it is challenged by the increasing importance of electronic media; 3) the relation between the book and the text that it carries. There were approximately a dozen presentations related to each of these axes, with a total of thirty four presentations over the two days of the conference. ‘Lives of the Book’ brought together scholars and book professionals from a number of major French universities (Aix-en-Provence, Grenoble, Lille 3, Paris 1, Paris 3, Paris 4, Paris 7, Paris 10, Paris 13, Poitiers, Rennes 2, Toulouse et Versailles–Saint-Quentin-en-Yvelines, ainsi que Nancy 2) and from a range of foreign countries (South Africa, Germany, Australia, Denmark, the United States, Iran, New Zealand, Poland and the United Kingdom). The three keynote speakers at the conference were Barbara Bordalejo (Director of the Center for Electronic Editions at Birmingham University), Marie-Françoise Cachin (Founder of the LEMA [Le Livre et l’Edition dans le Monde Anglophone] Research Group at Paris 7) and Tony Lacey (Publishing Director of Penguin Books, London). There were also presentations by the writer Philippe Claudel (prix Goncourt des lycéens 2007), by Célia Vila (Director of the Poisson Soluble publishing house in Toulouse) and by representatives of the Fontenoy-la-Joûte book village in Meurthe et Moselle, near Nancy. These presentations provided an excellent basis for dialogue between scholars working in a university setting and book professionals. ‘Lives of the Book’ continued the study of questions related to archival research, textual scholarship and book history within the IDEA research team which had been intiated the previous year by the conference ‘Left Out: Texts and Ur-Texts’. In the years that followed the organization of the event, IDEA’s literary research was restructured so as to include a specific focus on textual scholarship, as indicated by the name of the ‘Littérature et Etudes Textuelles’ research axis. 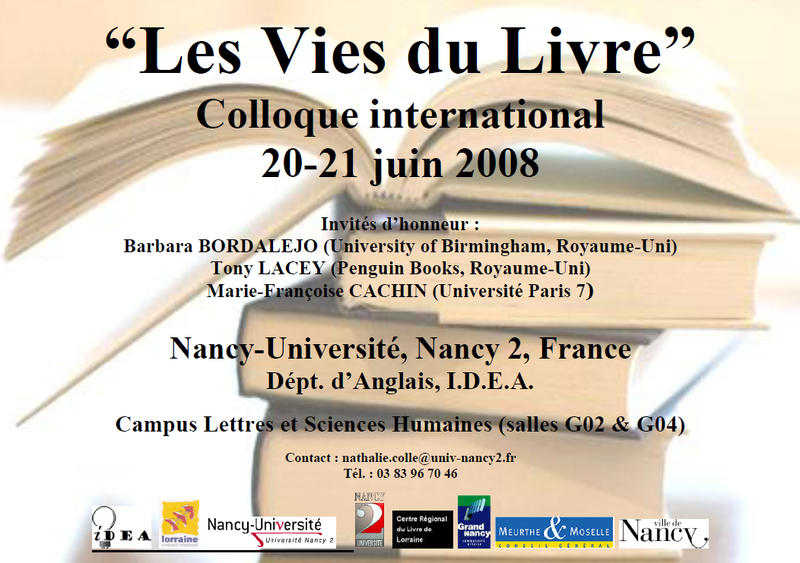 A collection of peer-reviewed and revised articles based on the presentations given at the conference was published by the Presses Universitaires de Nancy: Les Vies du Livre / Lives of the Book (2010).